decided to get in shape but can’t seem to shed the last few pounds? If you are unsatisfied by the appearance of problem fat, and are looking for an effective solution to tighten and sculpt your body, there is now an advanced treatment available to you. With the innovative technology used in SculpSure body contouring treatments, you can achieve a slimmer and toned silhouette. A study published in the medical journal, Lasers in Science and Medicine, reports that a single treatment can achieve a 24% reduction of fat in the target area. In Journal of Dermatological Surgery, 96% of patients treated with Sculpture were happy with their treatment. SculpSure is an advanced laser treatment that is designed to effectively target and eliminate the appearance of problem fat on a cellular level. 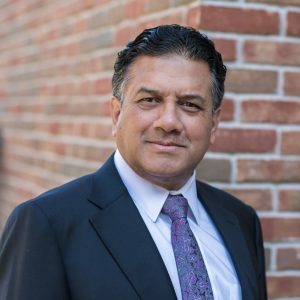 This non-invasive procedure is an FDA cleared and customizable treatment for successfully targeting and destroying fat cells. You can achieve the firm shape you desire with this safe and quick remedy. SculpSure is performed through the use of a specialized laser. During treatment, the attached tool is held to the treatment area. The laser technology then works to emit laser energy that penetrates into the deeper layer of skin. The energy then targets the fat cells by heating them, without harming any of the surrounding tissue. When SculpSure raises the temperature of the fat cells, their structural integrity is damaged. Over the next few months following treatment, the damaged cells are metabolized and flushed from the body. Not only does SculpSure innovative system destroy the fat cells, but it actually works to permanently eliminate them. This is a safe procedure that can effectively eliminate your problem fat for good. SculpSure treatments can improve the appearance in a variety of areas on your body including common problem areas. These can include areas of the stomach, arms, back, and neck. Multiple treatments are often suggested in order to achieve optimal results. If you are ready to achieve a slimmer and more contoured appearance, SculpSure could benefit you. Why is SculpSure Better Than CoolSculpting? No Suctioning: CoolSculpting technology is different, because it freezes fat. The initial freezing part can be quite uncomfortable. Part of the treatment also requires an uncomfortable suctioning of the fat. The fat gets frozen and takes the shape of the applicator. This has been described as a “hunk of butter under your skin”. The suctioning can be quite painful to some, and many are left with tenderness, redness and even bruising after their Coolsculpting treatment. (Ouch!) 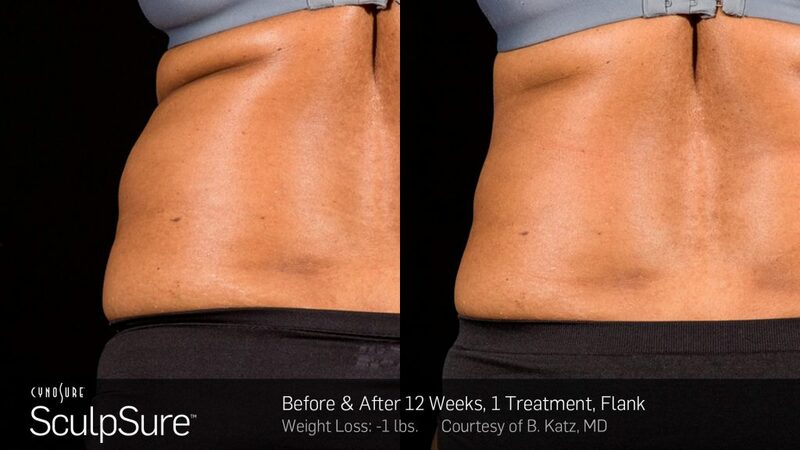 SculpSure only melts the fat and requires absolutely no suctioning, so your body can more quickly eliminate it from your body. 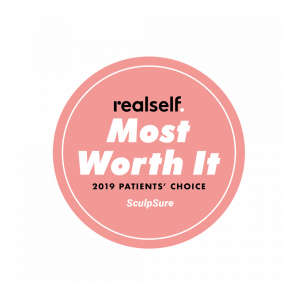 More Affordable: The cost of SculpSure is actually more affordable than CoolSculpting, as each session typically costs less. 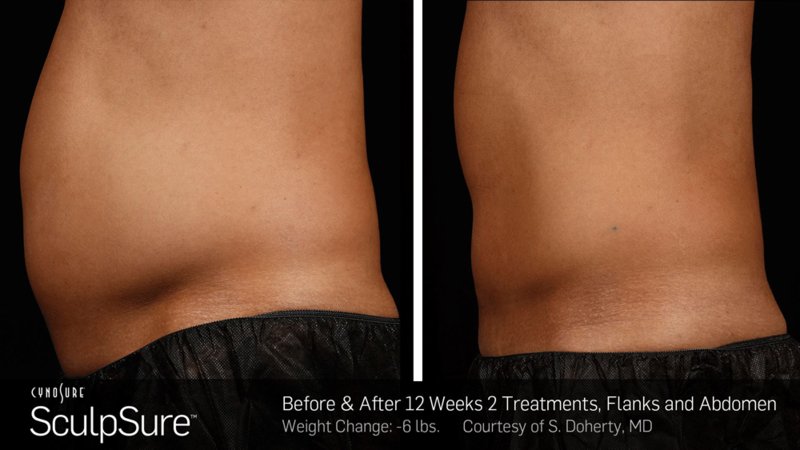 Faster Treatments: SculpSure can target anywhere up to 4 areas in a single treatment session. CoolSculpting can only do 1 or 2, and it usually takes about an hour or more. A single SculpSure session takes only about half an hour. Imagine how much time you’ll save! Faster Recovery: You’ll need to wait a little longer to see the results of a CoolSculpting treatment, since the recovery period is lengthier. In fact, side effects from CoolSculpting can last up to 2 weeks! On the other hand, SculpSure requires no recovery and any redness dissipates fairly quickly. If you are ready to say goodbye to your stubborn fat, you can achieve a more sculpted appearance with SculpSure treatments. Reach out to us here at Cosmedical Rejuvenation Clinic to learn more. Contact us today and schedule your consultation!